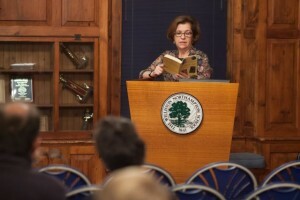 In her talk at the Grubbs Gallery on September 23, author Joan Wickersham offered to break down the minutiae of two of her books, about suicide and love, respectively. The first of the two, The Suicide Index, took Ms. Wickersham 11 years to write in part, she said, because the initial finished version was a novel, a “very polite, dead book.” So when she began to edit the material, Ms. Wickersham found herself throwing out every chapter. “I was trying to treat suicide as a conventional story,” she said, shaking her head. What emerged instead—once she had disposed of the idea that she could take her father’s suicide and turn it into a novel—was a series of fragments that the author then arranged alphabetically, imposing a form of order on a chaotic experience. 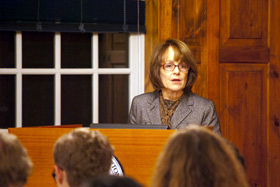 The best ideas and strangest rhymes come to her when she is half asleep said poet Mary Jo Salter on November 11 during her Writers’ Workshop Series lecture at the Williston Northampton School. 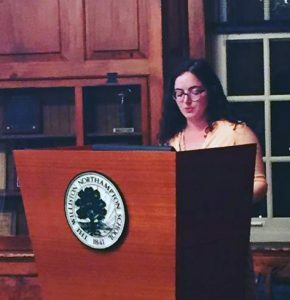 Madeleine Blais, co-founder of the Writers’ Workshop Series, likened Ms. Salter’s poetry to “the gift of water from ice,” in her introduction of the John Hopkins professor. 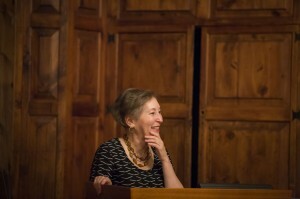 Ms. Salter was the fourth and final speaker in the 16th annual series. “She takes the moment that is utterly forgettable and turns it into something utterly memorable, which is to say her words are shapeshifting and miraculous,” said Ms. Blais. 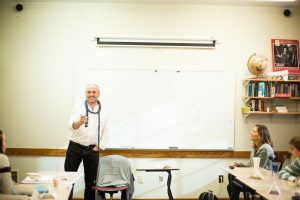 Sixteen years ago, authors Madeleine Blais P’00, ’04 and Elinor Lipman P’00 combined forces to create the Writers’ Workshop Series, a long-running lecture series that invites fiction and non-fiction writers, playwrights, journalists, and poets to speak to students and to the general public. On Monday, November 5, Ms. Blais introduced her fellow co-founder by first listing several of the renowned authors that had visited the Williston Northampton School since the series began in 1998: Wally Lamb, Arthur Golden, Anita Shreve, Tracy Kidder, and Nikky Finney, among others.